1 edition of Neue Möglichkeiten der Standardisierung von Spitalkennzahlen found in the catalog. Add another edition? Are you sure you want to remove Neue Möglichkeiten der Standardisierung von Spitalkennzahlen [New Possibilities for Standardizing Hospital Performance Indicators] from your list? Published 1987 (3rd ed. 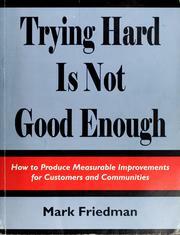 ), 1986 (1st ed.) by Office of Evaluation Research, Department of Public Health and Social Welfare of the Canton of Bern, Bern, Switzerland in Bern, Switzerland . Working Papers of the Office for Evaluation Research, No. 4. Dept. 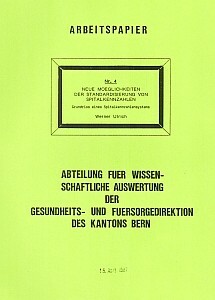 of Public Health and Social Welfare of the Canton of Bern, Bern, Switzerland. Updated 3rd ed. 1987 (orig. 1986). April 11, 2012 Created by Werner Ulrich Added new book.